Important Ship Models built by Joachim Dzierzenga, prior prisoner of war. 1151) Palladium 3 stone Diamond Ring; 1110) 18K Martini Cut Diamond Ear Studs; 1112) Aquamarine & Diamond Necklace in Platinum & 14K. 1055) 19th Century Steinway Baby Grand Piano: Serial #60704, which dates to 1887-1888. Provenance: Estate of Eloise Gallagher whom was great friends with Liberace, and he has played this piano in her home! 1055) 19th Century Steinway Baby Grand Piano: Serial #60704, which dates to 1887-1888. Provenance: Estate of Eloise Gallagher who was great friends with Liberace, and he has played this piano in her home! 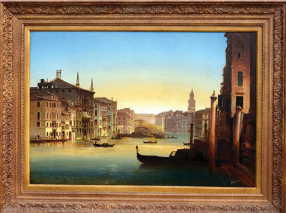 private collections of important Paintings, Prints and Sculpture by Modern Masters as well as listed and exhibited Artists to include Salvador DALI; Narcisse- Virgil DIAZ DE LA PENA; Venetian Grand Canal Painting by GUARDI? ; Nachum GUTMAN; Benjamin LEADER; Alexandre LEONARD, Bronze; Carl Julius Emil LUDWIG; Peter MAX; Joan MIRO; Benson Bond MOORE; Laszlo NEOGRADY; Violet OAKLEY; Julian ONDERDONK; Jakob SCHMUTZER; SHALOM OF SAFED; Alton S. TOBEY; Pierre Nicolas TOURGUENEFF; James TYLER; Charlotte WEEKS; Hiroshi YOSHIDA; Old Master landscapes and many more. Also Featuring 18th and 19th Century Period Furnishings, Porcelain and Artworks as well as over 10+ phenomenal estates. 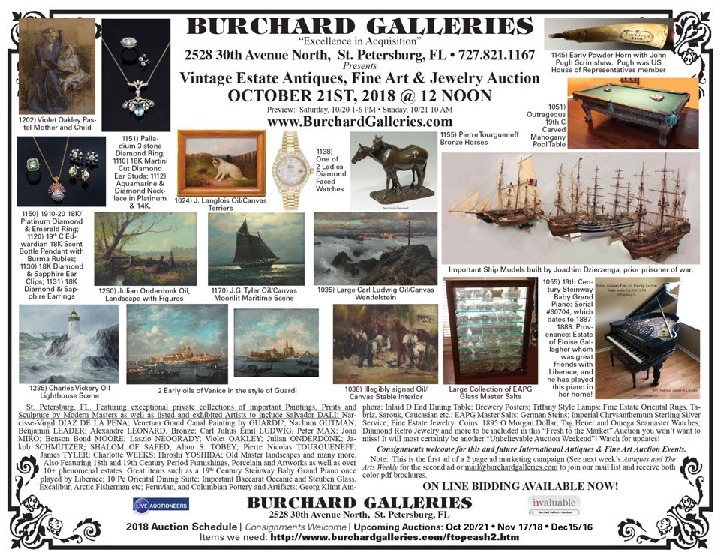 Great items such as a 19th Century Steinway Baby Grand Piano once played by Liberace; 10 Pc Oriental Dining Suite; Important Baccarat Oceanie and Steuben Glass, Excalibur, Arctic Fisherman etc; Peruvian, and Columbian Pottery and Artifacts; Georg Klimt Amphora; Inlaid D End Dining Table; Brewery Posters; Tiffany Style Lamps; Fine Estate Oriental Rugs, Tabriz, Sarouk, Caucasian etc. ; EAPG Master Salts; German Steins; Imperial Chrysanthemum Sterling Silver Service; Fine Estate Jewelry: Coins: 1895 O Morgan Dollar; Tag Heuer and Omega Seamaster Watches; Diamond Retro Jewelry and more to be included in this “Fresh to the Market” Auction you won’t want to miss! It will most certainly be another “Unbelievable Auction Weekend”! Watch for updates! Consignments welcome for this and future International Antiques & Fine Art Auction Events. 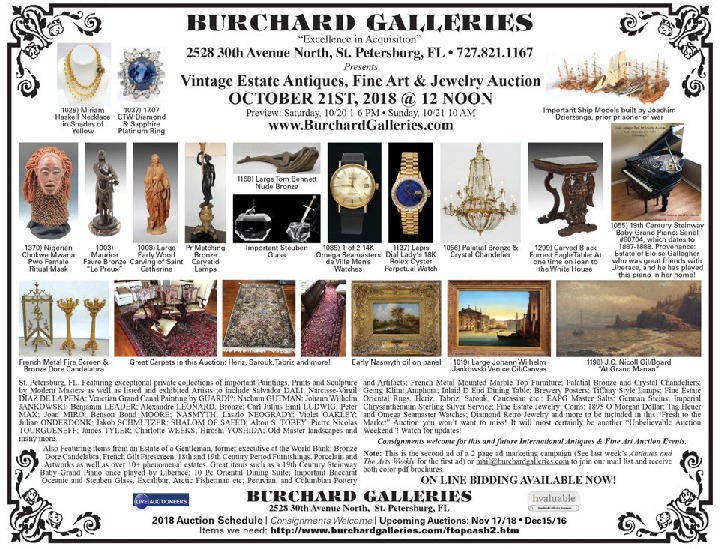 Note: This is the first ad of a 2 page ad marketing campaign (See next week’s Antiques and The Arts Weekly for the second ad or mail@burchardgalleries.com to join our mail list and receive both color pdf brochures.